Indonesia's latitude and longitude is 5° 00' N and 120° 00' E . Below is the map of Indonesia showing major towns, roads, airports with latitudes and longitudes plotted on it. The Republic of Indonesia is located on the geographic coordinates of 6.1750° S latitude and 106.8283° E longitude in Asia. The geographical alignment of Indonesia suggests latitude of 5° 00' N and longitude of 120° 00' E.
The definite latitude of Indonesia signifies its position in Northern Hemisphere and its proximity to the equator. The country of Indonesia is actually a terra firma amid the Pacific Ocean and Indian Ocean. 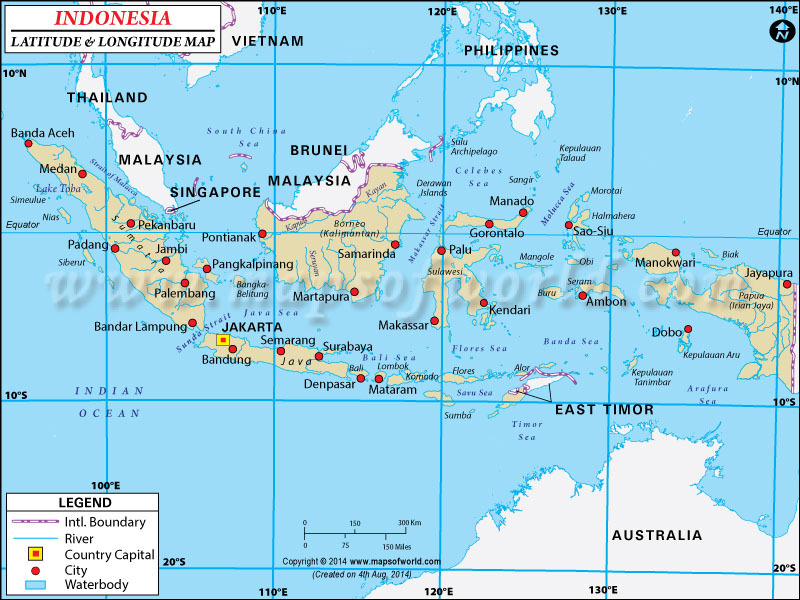 The country of Indonesia incorporates 1,919,440 square kilometers of area in the southeastern region of Asia. The terrain of Indonesia is pervaded by valley and lowland in coastal areas while crags are found in the bigger islands of Indonesia. The climatic condition of Indonesia is specified as tropic climate which is arid and damp whereas the upland areas are dominated by moderate temperature. The latitude and the longitude of Jakarta the capital of Indonesia are 6° 10' S and 106° 48'E respectively. The difference of time is UTC+7.